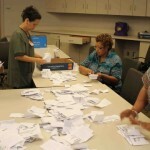 Hopkins caregivers turned out in force on July 10 and 11 and voted overwhelmingly to approve our new union contract. 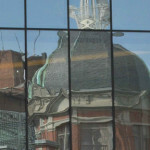 It includes pay raises as high as 38%, and was called a "win-win" for the city by the Baltimore Sun. Read the Sun editorial. After a long night Monday, and four months of intense work by Hopkins caregivers and supporters, our 1199 bargaining team reached agreement with management on a tentative contract that substantially lifts wage rates. 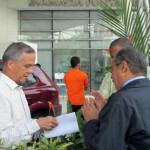 See the press release (PDF). Hopkins President Ronald Peterson got $15.4 million in total compensation in 2013. Peterson’s base pay jumped 9.25%, but he's telling caregivers to take a 1.5% raise in 2014. Read the Sun op-ed about his pay by 1199 member Yvonne Brown. Hopkins executives recently staged a feel-good town hall meeting to tout their wellness and diversity initiatives. 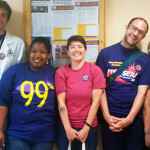 But the execs started looking a little sick when dozens of Hopkins workers, docs and students showed up wearing 1199 purple. 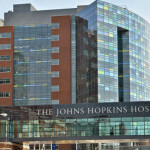 Poverty pay at Hopkins is becoming a global scandal. 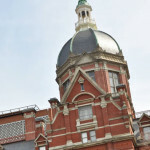 Labor allies around the world and here in the U.S. have leafleted at Hopkins-affiliated hospitals, informing patients, administrators, and the public about unfair wages at Hopkins’ flagship hospital. 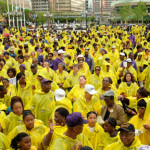 More than 3,500 Hopkins caregivers and supporters packed the Inner Harbor Saturday, May 10 at the Mothers' March & Rally for Justice. Danny Glover and Wendell Pierce helped take our fight to end poverty pay to the next level. Watch the video. 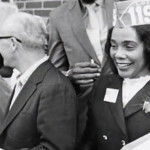 Forty-five years ago, Coretta Scott King helped Hopkins caregivers form our union and win a better life. But now Hopkins management is trying to turn back the clock and erase the gains she made. See how we’re honoring her legacy in today’s fight. 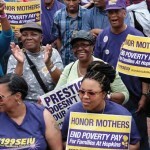 The caregivers of Johns Hopkins are fighting to end poverty pay at America’s #1 hospital. Right now, one-quarter of the 2,000 service, maintenance and technical workers at Hopkins make less than $11.47 an hour — that’s the poverty level for a family of four. “The mission of Johns Hopkins Medicine is to improve the health of the community.” That’s the first line of the Hopkins mission statement. And yet Hopkins pays its own employees so poorly that many rely on Medicaid and food stamps. When Hopkins opened its new $1.1 billion medical towers in 2012, the Sun wrote they would “change the way Hopkins practices medicine.” Unfortunately, one thing hasn’t changed. 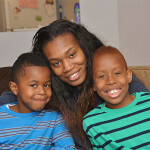 The hospital still pays poverty wages to caregivers.